I’m going to give it to you straight- I, honestly, have no idea what makes these greens “Country Style”. Most of my childhood was set in suburban/inner-city areas. But, when I think of “Country Style” food I think of food that is slow-cooked, wholesome, and tastes of love. 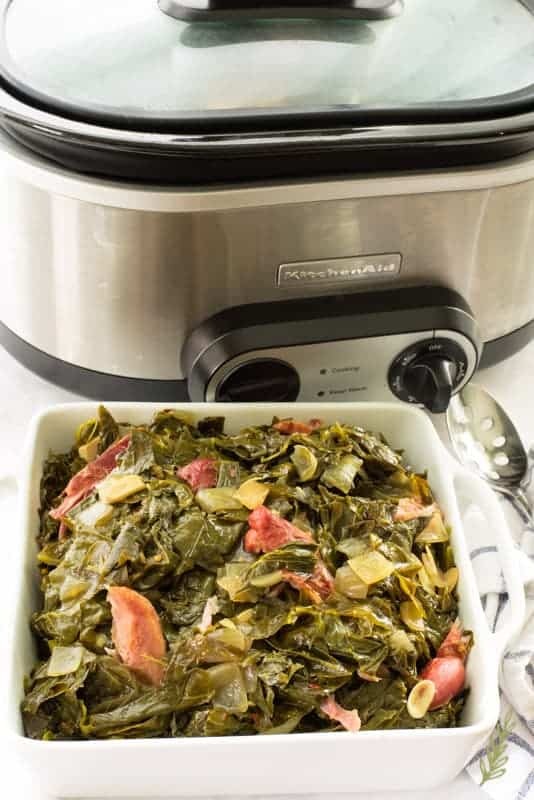 As such, I think my slow cooker Country Style Collard Greens have earned their moniker. You can taste when someone has prepared a dish with love. Usually, food that is made by a person who wanted to make it tastes amazing. Food made begrudgingly tastes, well, not so amazing. These greens are slow cooked with minimal babysitting, which means you’re not fussing over them in irritation. That also means they taste of your love. I have loads of people who come to Thanksgiving dinner- no exaggeration. Although my husband is on leave preparing for retirement, his former Soldiers (as well as we) have become accustomed to our annual Thanksgiving dinner. These Soldiers can’t always go home for the holidays, so we make our home theirs. That means I need to prepare ample amounts of food, with limited space, for people who like to eat. Part of how I accomplish my mission is by preparing and freezing dishes that taste better as they sit- these greens. I also use my slow cooker to make foods that require long periods of cooking- again, these greens. This frees up my stove and ovens for other dishes. 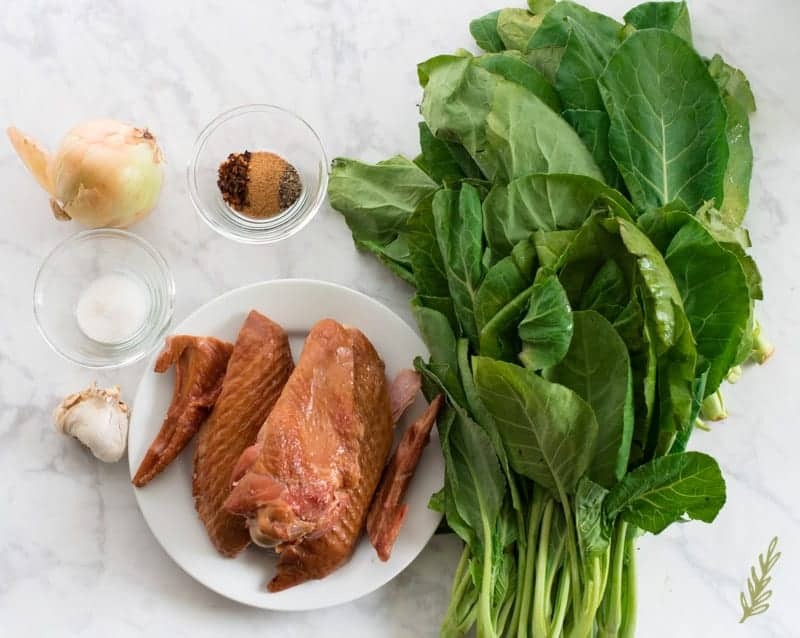 A spice blend (seasoned salt, pepper, and crushed red pepper), sugar, fresh garlic and chopped onions, smoked turkey wings, and collard greens are all you need. Oh! You’ll also need slow cooker. If you haven’t heard, I’m bi-racial. My father is African-American from New Jersey, my mother was Puerto Rican by way of Brooklyn, NY. Because I didn’t have much contact with the black side of my family, I had to educate myself on my black culture on my own. Growing up in a very diverse neighborhood afforded me what my home did not- exposure to traditionally black dishes. Collard greens made by a black grandmother are untouchable. 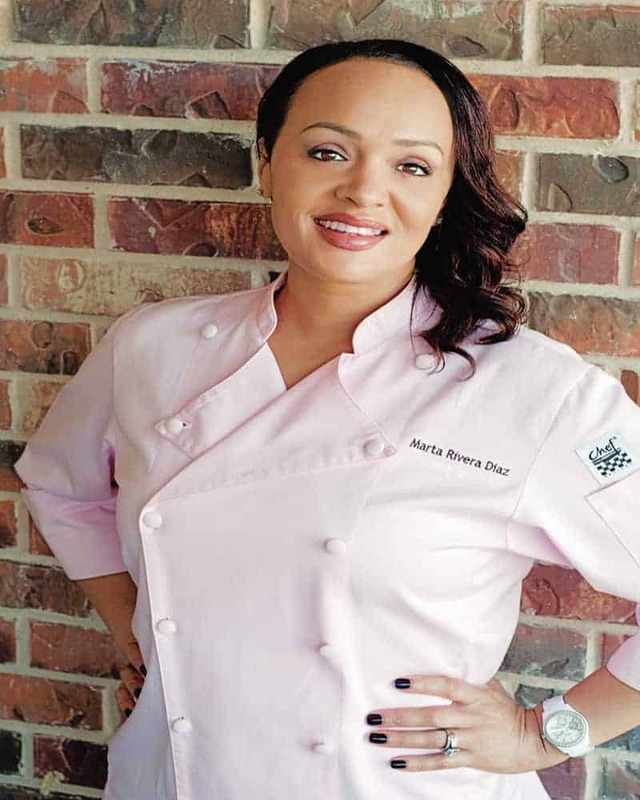 After doing research, it was easy to see that the slaves of our Southern states- as cooks- influenced a lot of what we have come to know as “Southern/Soul Food”. In fact, they were its creator. In spite of my ancestor’s migration from South Carolina to New Jersey, they still managed to hold fast to those foods they grew up eating. As the descendants of slaves and share-croppers, food like these collard greens kept them close to their roots. Unfortunately, I wasn’t handed down the recipe. So, I did what I always do and figured it out on my own. 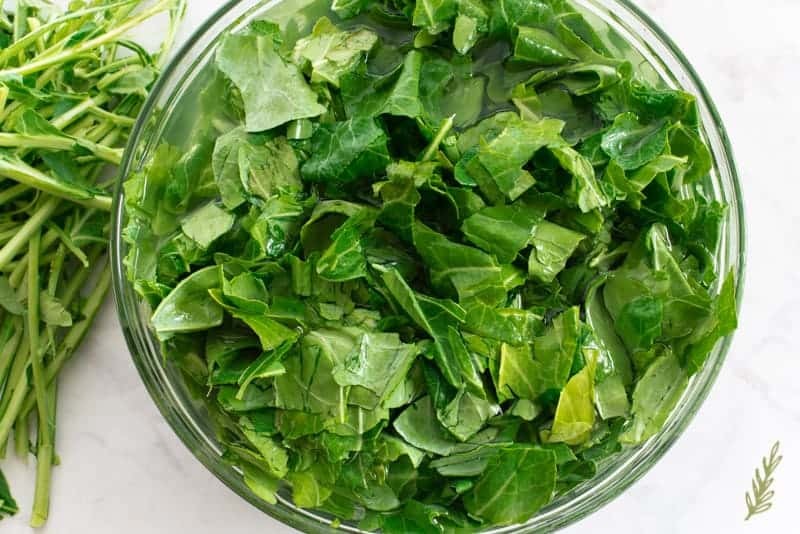 Collard greens (as with most broad, leafy greens) are tough if they’re not cooked low and slow. 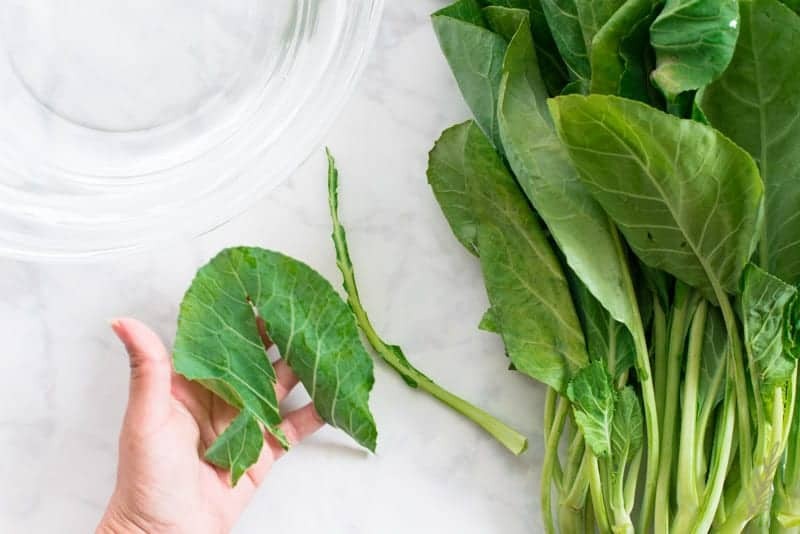 You may not think so to look at the thin leaf, but take one bite of a hastily stewed collard, and you’ll know. 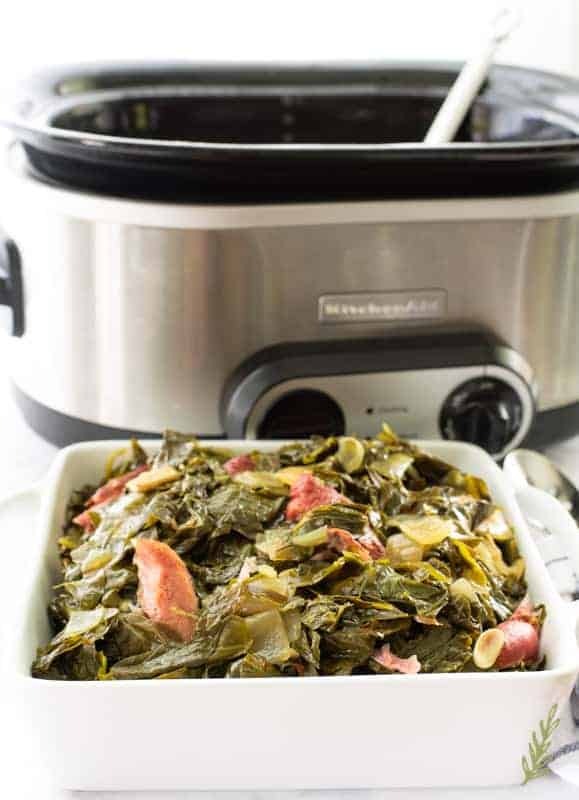 Anywhere from six to eight hours is the optimal time for slow-cooking a batch of collard greens. The plant grows from the ground in the same way cabbage or lettuce does. Leaves can grow a couple of feet high, year round, but their season is late autumn and winter. This is when they’ll taste best. They have bitter flavor, which I offset with the addition of sugar. Look for dark green leaves with minimal yellowing and insect bites. You want leaves that are firm, not wilted, or velvety soft. The stem, when broken, should snap and not bend, or feel rubbery. If you really want to make country style greens, scrub your sink with dish soap and very hot water. Make sure to scrub well in the crevices where the drain is. Rinse the sink of all suds, then fill your kitchen sink with bleach water. Allow this solution to sterilize the sink for a minute or two. Drain the bleach water, and rinse the sink out again with warm water. Make sure to rinse the sink out thoroughly to eliminate any residual bleach. The sink is the most common way great- and grandmothers washed their greens. It provides lots of space for the dirt to be washed away and settle at the bottom of the sink. You can also pull out the largest bowl you own, and fill it with water, instead. 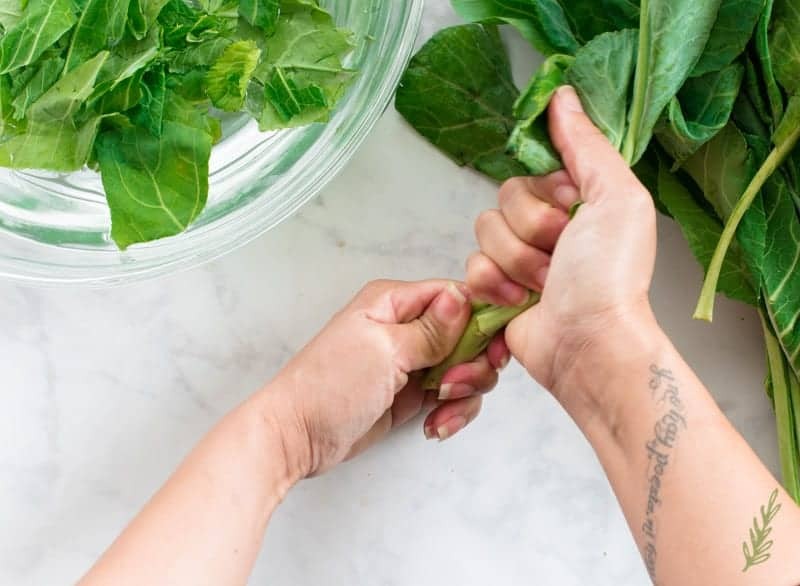 Use your hands to tear off the ends of the collard green stems. This is a quick way to separate the leaves. I grab the sides of the broad leaf and bend them away from the stem (see image). Pinching the leaf together close to the underside of the stem, I use my opposite hand to pull the stem up and away from the leaf. This may take some practice to get the stem off cleanly, but the goal is just to separate the stem from the leaf. Once I have de-stemmed the leaves, I tear them into one to one-and-a-half inch pieces. Tiny leaves will have tender stems, in the case of those, I just tear the leaves with the stems. The stems aren’t good for much except composting, or for using (in small quantities) in a vegetable broth. You can save them for those purposes, or just discard them. I know of people who don’t feel the need to clean their produce. Since I’m not put on this earth to judge, I won’t. I will, however, say I don’t trust people enough not to wash my produce before cooking or eating it. Not only do I need to remove any pesticides sprayed on these greens, I need to rid them of grit and dirt. Collards grow well in loose, sandy types of soil, which is collected along with the leaves when the greens are harvested. There’s nothing worse than getting a mouthful of grit when you’re eating greens. Like, a root canal doesn’t even compare. And don’t let them taste good!! You’ll be madder than a three-legged dog trying to bury a turd on an icy pond. No, sir. Not me. Wash ’em. To ensure your greens won’t piss anyone off, submerge them in your sink (or bowlful) of cold water and agitate the water to shake loose that grit. I like to pretend that I’m “shampooing” the leaves by gently rubbing them between my hands. Not too roughly, but enough to rub off the dirt. This is my water following the first wash. YECH, right?!?!? I repeat the washing process two more times. If you’re not feeling the triple-wash deal, just buy the collards bagged. Usually, bagged collards are triple-washed. If you choose the bagged variety, just skip this washing step. I’m a huuuge fan of flavor. Flavorless food annoys the crap out of me, to be quite honest. Don’t talk to me ’bout no, “Add one clove of garlic to your dish,” because I’m going to read that as I need to add three. Don’t play with me. To inject flavor into my greens, I use smoked turkey wings (legs also work). Smoked ham hocks are what I used to use, but because I have such a variety of people attending Thanksgiving dinner, I now make them pork-free. If you don’t need to worry about that, feel free to substitute pork for the turkey. The smoked meats transfers its flavor to the greens and adds an additional layer of flavor. If you have a vegan, or vegetarian, coming to dinner, omit the smoked meat and substitute vegetable broth for the chicken broth, instead. 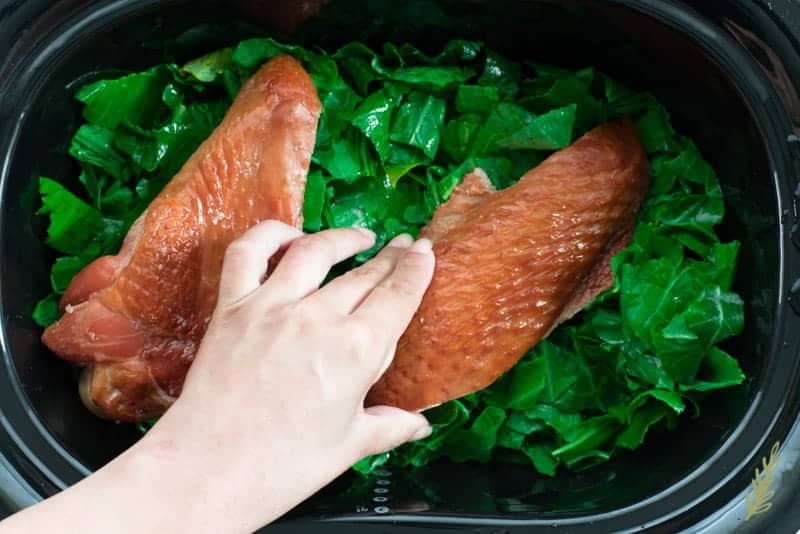 Because I want that flavor to permeate the entire batch of greens, I layer the wings and the greens in my slow cooker. Make a bed using half the greens and place the half of the wings on top. Add your chopped onions, garlic, and the chicken stock. Don’t use too much liquid because you want the greens to simmer. If they stew, they’ll become water-logged and soupy. Season with the sugar, spice blend, and the white vinegar. Top with the rest of the greens and the wings you may have left. Cover the greens. 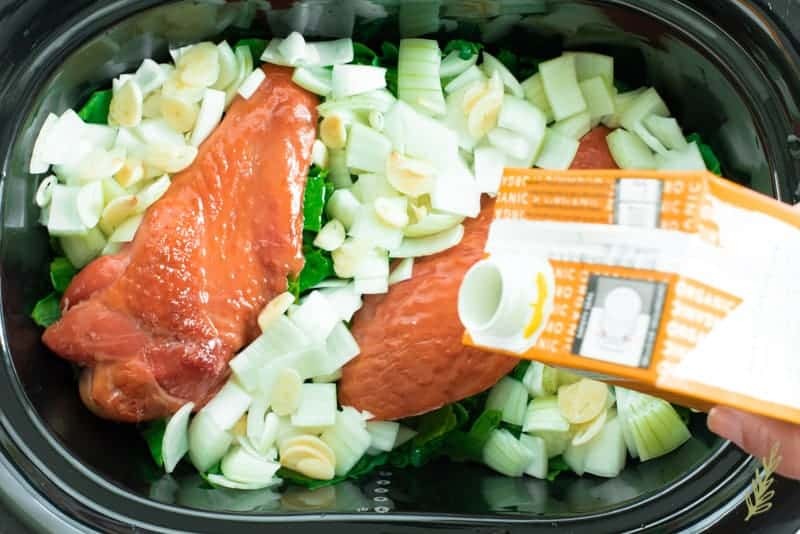 Don’t worry if the greens are barely fitting into the slow cooker, they’ll wilt down a crazy amount within an hour, so you’ll be fine. 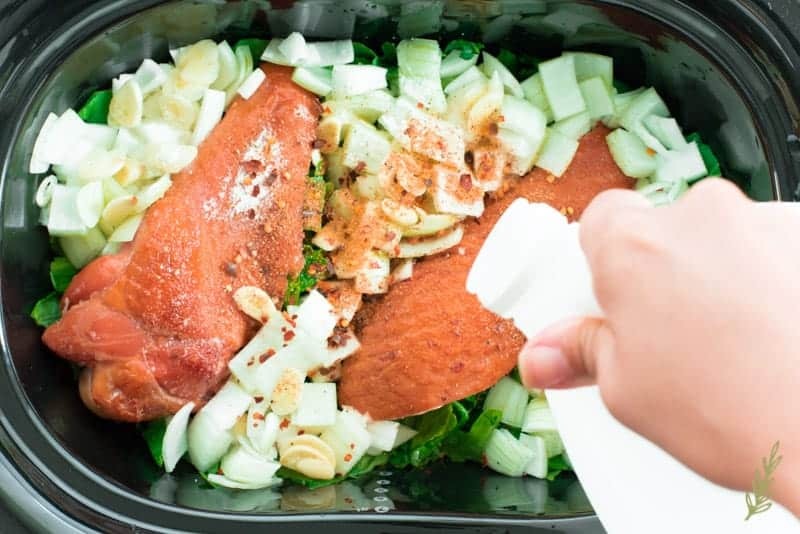 Set your slow cooker’s timer to six hours on low or medium-low and go about your life. Check in every once in awhile, and give the greens a stir. This ensures the top layer of greens is getting as much love as the bottom. The greens won’t be cooked in six hours, but that six hour mark is the baseline for checking in on the greens more frequently. After you’ve reached that six hour point, taste-test every hour (up to a max cooking time of nine hours) to see if the greens are tender. 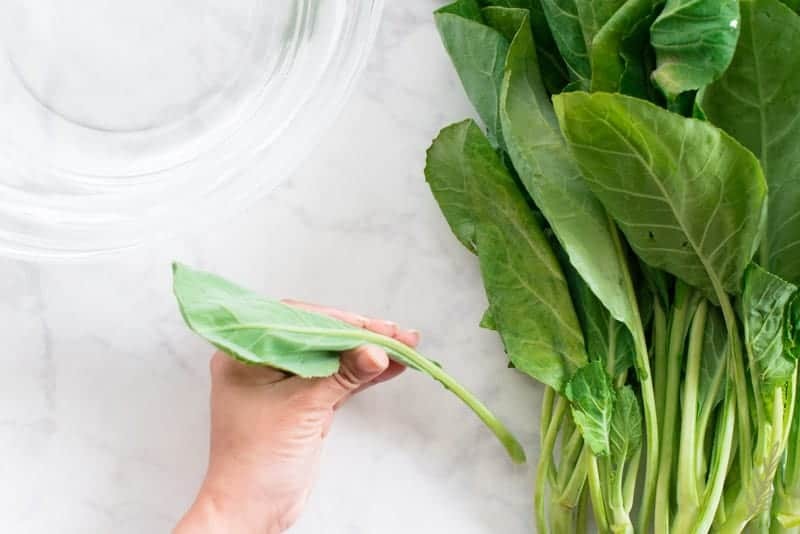 A tender green doesn’t offer resistance when you bite into it (like a bagel does), but is tender like a wilted spinach leaf. Once the greens are fully cooked, remove the turkey (or pork) from the greens and allow the meat to cool slightly. Once you can handle them, remove the meat from the bones and stir the meat back into the greens. 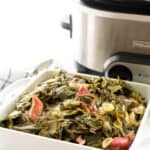 Here’s what I love about this Country Style Collard Greens recipe- you can either transfer it to a fancy-schmancy serving dish (as pictured), serve it directly from the slow cooker (it is country style, after all), or bag it to freeze for later. These greens are like lasagna or stew, in that the longer they sit, the better they taste. If I plan to serve them for Thanksgiving, I bag and freeze them lying flat; then I store them upright when they’ve frozen solid. On Turkey Day, I pull them out of the freezer the night before and allow them to thaw in the fridge. Since they’re fully cooked, they only need to be warm through- which I can do after the the turkey and pernil have been pulled out of the ovens. Just give them a stir during their warming period to make sure it’s completely hot throughout. This Country Style Collard Greens recipe is a must for Thanksgiving Day. A must, I say! (dropping dope beats, what what?!?!) Pin this recipe to add to your holiday meal plan. Begin early in the day. These greens are simple to make and are full of flavor. If you choose the bagged variety, just skip to the "Assembling the Greens" step . Fill your cleaned kitchen sink, or a very large bowl, with cold water. 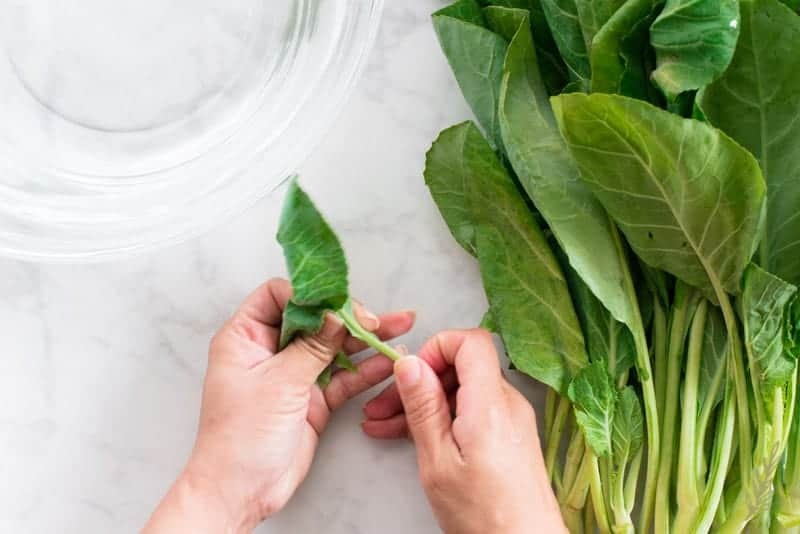 Separate the stems from the collard's leaves, then discard the stems. Tear the into 1-1 1/2" pieces, and submerge them in your sink (or bowlful) of cold water. Agitate the water to shake loose any grit from the leaves. Repeat this washing process two more times. Drain the greens in a strainer. In a large (7-10 qt) slow cooker, create a bed using half the greens, and place half of the wings on top (if you have multiple wings). If you only have two wings in your package, place them both in now. Add the onions, garlic, and the chicken stock. Season with the sugar, seasoned salt, black pepper, red pepper flakes, and the white vinegar. Cover with the remaining greens and the any wings you may have left. 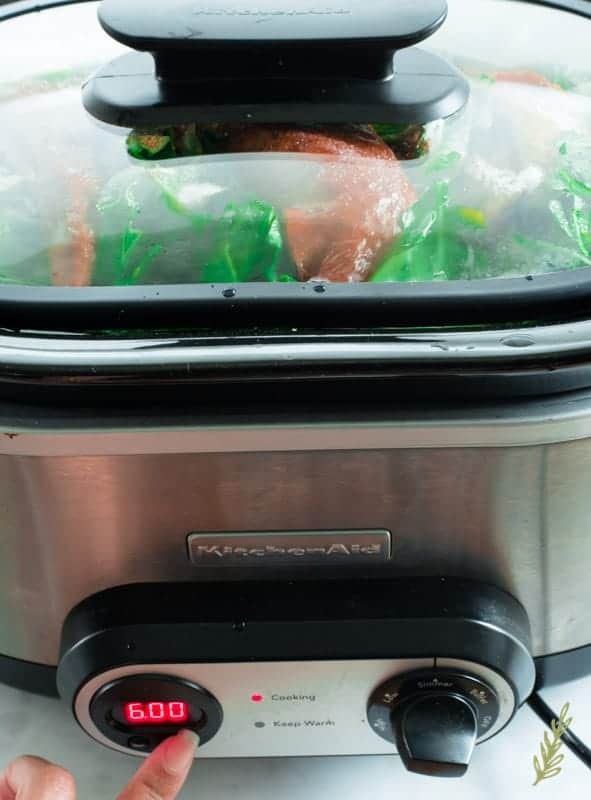 Place the lid on the slow cooker, pressing down if the greens are higher than the top of the slow cooker's insert. They'll wilt down within an hour of cooking, so this is okay. Cook the greens for 6 hours on low or medium-low. Check in after a couple of hours and give the greens a stir. Once the greens are fully cooked, remove the turkey from the greens and allow the meat to cool slightly. Once you can handle them, remove the meat from the bones and stir the meat back into the greens. Serve while hot directly from the slow cooker, or transfer to a serving dish. 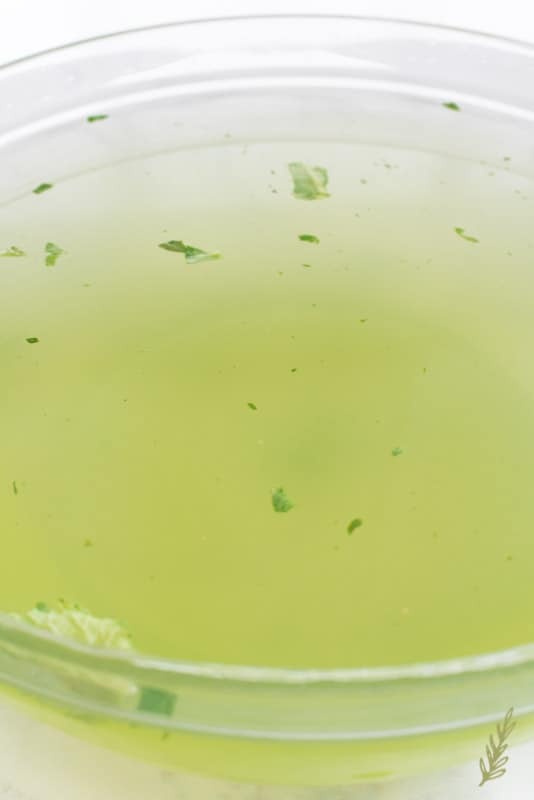 For vegan or vegetarian greens, omit the smoked turkey and use vegetable stock instead of chicken. If you plan to serve them at a later date, bag them (hot or cold) in a heavy duty, freezer food storage bag. Squeeze out as much air as possible, and freeze them lying flat. Once they have frozen solid, store them upright to take up less space. When you're ready to serve the greens, pull them out of the freezer 24 hours in advance and allow them to thaw in the fridge. Since the greens fully cooked, they only need to be warm through, stirring occasionally during their warming period to make sure they're completely hot throughout. 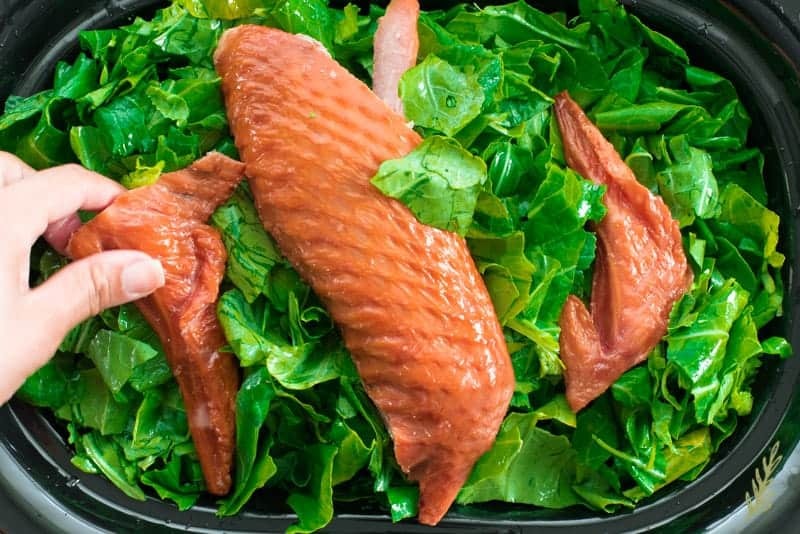 The greens may be held for safe consumption, on warm, for up to three hours. It is difficult, but it’s so worth it for me. Right?!?! I love that I can set it and forget it. It will still taste pretty good without the meat, Harmony. anything that makes dinners easier for me is a must in the kitchen! love how simple this looks! I love slow cooker recipes!!! It’s just so convenient and it saves so much time! I will be definitely be making this for dinner this week! Good!! I do hope you enjoy it, Andrea! This looks super yummy. I love trying new recipes…I’m definitely going to try this one! What a great recipe! I love that you make it in the slow cooker! I also love how you infuse everything with flavor! Flavor is LIFE, Lane! I’d be so sad without it, thanks so much for commenting! 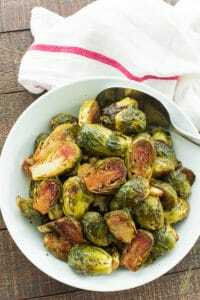 I’m usually not a huge veggie person but these sound delicious and so homey!! It is very non-veggie person friendly. Oh I love this!! Especially how you are connecting with your culture through food, which is one of the best parts of food isn’t it? So perfect for Thanksgiving. It IS the best part of cooking. I love tying the two together in a delicious recipe, Leigh! I think it’s so wonderful that you open up your home for Thanksgiving! My son is bi-racial and has no contact with the black side of his family. I love how you (and now he) can explore culture through food. It was hard not really knowing the black side of my family, but my friends made up for it. I’m still learning new things about myself every day, Christa. Give your little man a high-five from me. I always love collard greens when my mom makes them, but haven’t found a way to make and enjoy them myself! Definitely saving this recipe to give a try later as it looks delicious and flavorful! It really is, Amber! I’ve fallen in love with greens now that I make them myself. Honey you really showing off now……the story truly touched my heart! 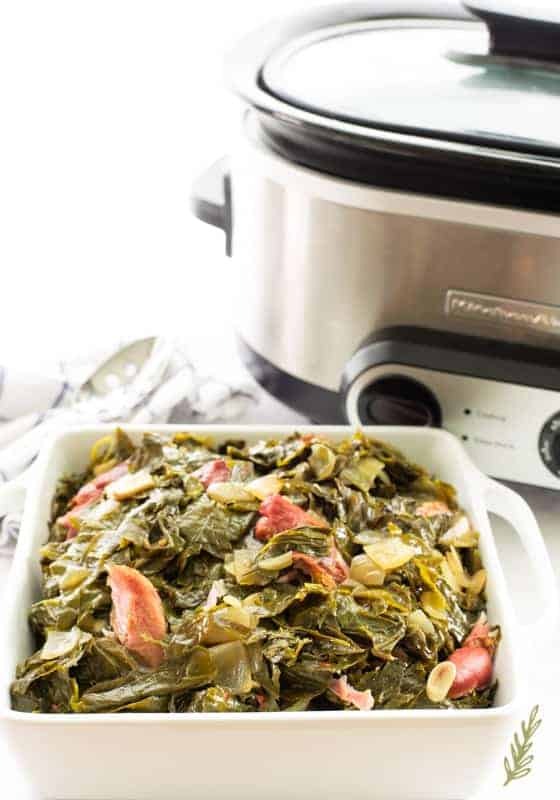 For the very first time in life….I will cook my collards this year in a crock pot! Just because you recommended it and will follow your recipe to the letter! I am so incredibly proud of you my Sister! YASSS!!! I hope you love both the taste and the ease of cooking them in the slow cooker! I love you! These greens were A-MAZ-ING! Stuck yo foot in it, slap yo momma, off the chain A-MAZ-ING even! Greens, particularly collard prepared country style right down to the hamhock and sugar and simmer on the stove for hours, have always been my favorite vegetable dish. 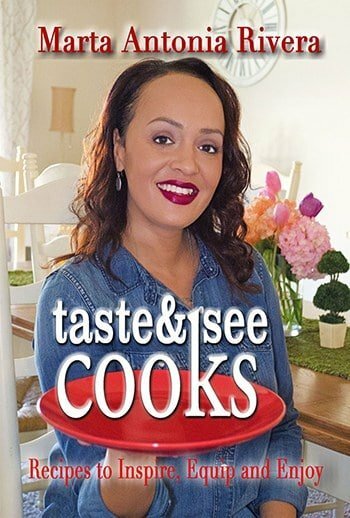 However, when I learned how to cook them, they remained my favorite in taste but became a distant marathon walker because of the time needed to make them, and when I moved from the south restaurants killed the taste with their practices of dressing the ugly baby up and calling it cute. In an instant (insert Angels singing on high here), your crockpot recipe has returned them to the first place finisher with a PR and has restored my faith in making them a regular dinner side dish. I did use turkey wings as the last experiences with hamhocks proved to be lacking in lots of meat.. I also loved that there is much less water used. Marta, you rock. Please create more awesome crockpot recipes for this working mom who struggles with time. What an amazing review! I love that it was such a hit with you and your family! More slow cooker recipes to come…I promise! 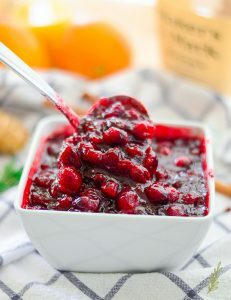 I forgot to add to my previous rating that I made the dish for Thanksgiving, and I was able to cook them overnight since they were in a crockpot. They were a hit with the family. My stepdad requested I leave him some leftovers even though he is a meat, potatoes and onion man. I am a huge crockpot fan, so when I saw this recipe I saved it for New Year’s Day. I have never made greens before and I absolutely love them, but typically only get them out at a restaurant. Well, no more!!! These were so simple to make and turned out delicious. The only thing better than being made in a crockpot is being able to freeze them. I can freeze them in a large container for hospitality or I can freeze them in smaller portions for when I’m craving some greens. I’m thrilled that I found this recipe-thanks, Marta!!!! I’m SO glad you made the choice to tackle greens, Marie! I’m even more glad that you loved them as much as you did. Kudos to you for attempting new adventures in the kitchen!